Arnold Schwarzenegger returns in his first starring role in almost a decade. 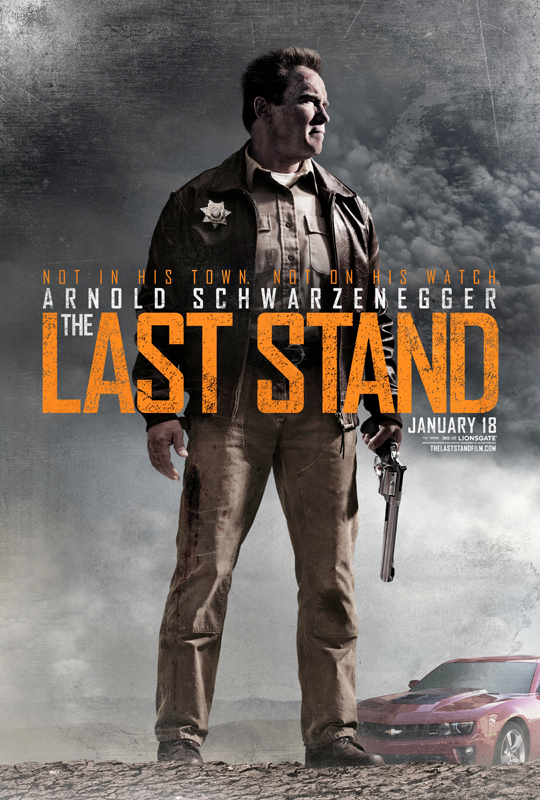 In The Last Stand he plays the sheriff of a quiet, dusty border town. When the kingpin of a Mexican drug cartel slips free of the Feds, Arnold and his band of misfits end up being the only thing standing between him and freedom. This plot got me thinking about other movies featuring law enforcement that are outmanned and face impending doom. Let’s call it – Police Under Siege. On the day of his marriage, Marshall Will Kane discovers that a man he sent to prison years ago is returning (at guess what time?) to exact his revenge. Kane asks the townsfolk for help but, feeling no debt of gratitude for Kane’s years of service, they turn their collective backs leaving him to face his enemy alone. Made at the height of the blacklist the film is widely regarded as an allegory for the McCarthyism and the Red Scare. And, as allegories go, it’s not a very subtle one. But it’s almost-real-time storytelling adds heightened sense of tension that either serves or supersedes its politics (depending on your own). While its roots are Left-leaning its fans are bipartisan. Both Dwight Eisenhower and Bill Clinton have sited the film as their favorite. It’s been screened at The White House more times than any other film. Clinton alone showed it 17 times. The right-wing response to the left leaning High Noon. John Wayne was incensed at the premise of High Noon. A small town sheriff cornered with trouble on the way. Wayne recoiled at the idea of a lawman running around town pleading for help. So he and director Howard Hawks decided to tell their own version of the story. John Wayne doesn’t beg for help; he actively rejects it. But, unlike his High Noon counterpart, people finally do come to his aid. Consider it a valuable lesson in the benefits of playing “hard to get”. Starring Wayne, Dean Martin, Angie Dickinson and, for some odd reason, Ricky Nelson Rio Bravo is Hawks strongest western (which is saying something considering that list includes Red River) and quite possibly his strongest film. Which is even more impressive given that Hawks, if not the greatest director Hollywood ever produced (yeah, I said it), is certainly its most versatile one. He directed true classics in multiple genres – Only Angels Have Wings (Romance), His Girl Friday (Screwball Comedy), Sergeant York (War), The Big Sleep (Film Noir), The Thing from Another World (Science Fiction), Gentlemen Prefer Blondes (Musical) and Scarface (Crime). And, interesting side note, John Wayne and Howard Hawks like this movie so much the remade it twice. Once as El Dorado in 1966 and again four years later as Rio Lobo.